Dominion’s master cylinder is factory tuned for the shortest dead stroke possible and a crisp bite point. 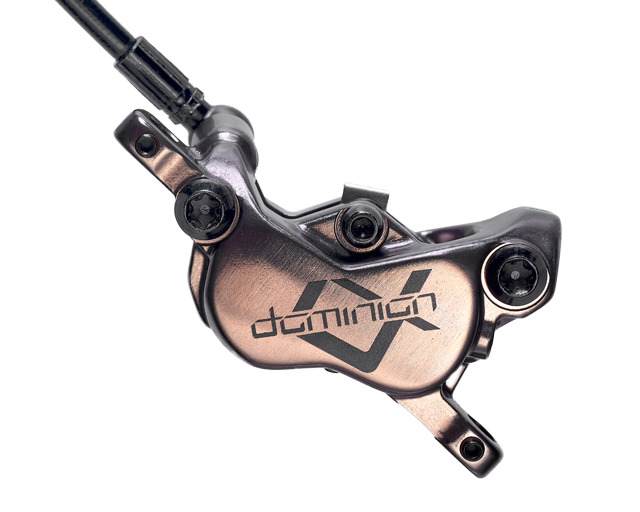 The Dominion A4 caliper utilizes four pistons in the most structurally rigid design possible. It features a cold-forged caliper and KingPin structural pad retention bolt that increases stiffness. With a motorsports inspired Two-Stroke dual port bleed system, industry leading DOT 5.1 fluid and Kevlar hose, the hydraulic system is engineered for ultimate performance across all temperatures and easy maintenance. Dominion A4 features the proprietary QuickBite² system for fast and consistent burnish, coupled with our D-Series rotor to manage the heat with less braking noise.